It’s true that you really can never have enough hard drive space; you bought that 500GB drive thinking “there is no way I’ll ever fill this!” and then sure enough, six months down the line, it’s clogged with game installs, TV episodes and your increasingly expanding MP3 collection. Then there’s the concern over the safety of your data – unless you’re running a mirrored RAID array all your precious data could be gone in the event your hard disk decides to stop working. While there are plenty of back up methods, ranging from multiple drive NAS storage solutions to online backups, for most people these are either too expensive, too slow, or too complicated to setup. 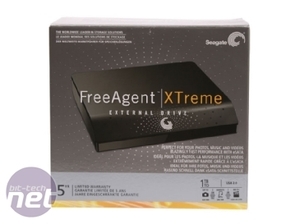 This is where external drives like the Seagate FreeAgent|XTreme 1TB come in, providing a portable, easy to use external hard drive which packs enough storage, performance and connectivity options to fill most desktop storage needs. This new drive represents a refresh from Seagate for the whole FreeAgent external hard drive product line, with the full range of both 3.5” and 2.5” drive enclosures receiving an exterior facelift, increased drive capacities and expanded connectivity options. 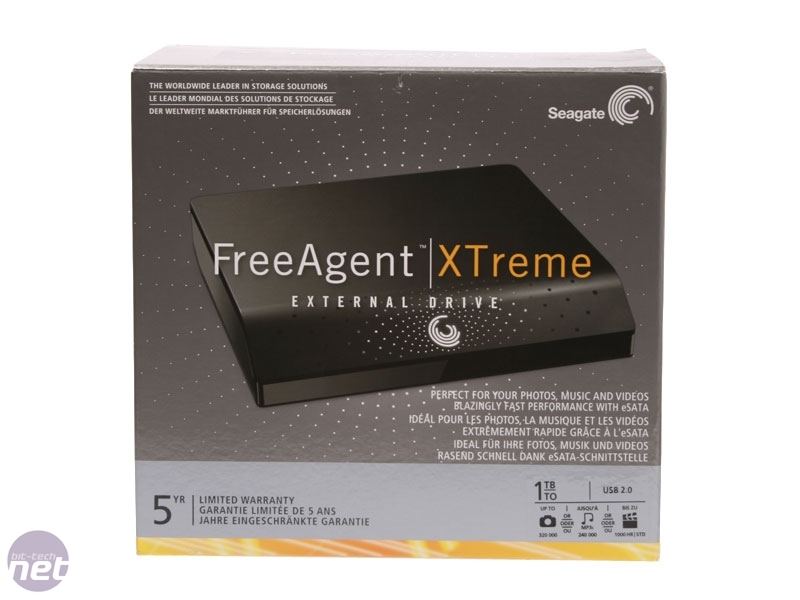 The FreeAgent|XTReme range is available in 500GB, 640GB, 1TB and even 1.5TB flavours are powered by Seagate’s Barracuda 7200.11 7,200RPM, 32MB Cache SATA hard drives and the enclosure offers USB 2.0, eSATA and Firewire 400 connectivity. 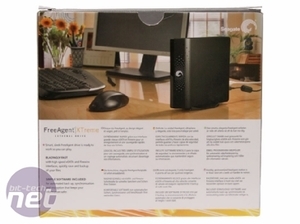 There’s also a FreeAgent|desk option available in white with the same capacities, but without the Firewire 400 or eSATA connectivity options. The external design has also seen an update from the old FreeAgent drives, although the shape hasn’t changed too much. Measuring 175mm x 34mm x 172mm, and able to sit flat on your desk or on its side thanks to the included stand. The FreeAgent|XTreme certainly wouldn’t look out of place on the most stylishly arranged desk thanks to its swish new logo. Thankfully Seagate have done away with the garish backlit orange stripe on the older Freeagent drives, choosing to replace it with a subtly backlit white front panel that looks very cool with the drive powered up. 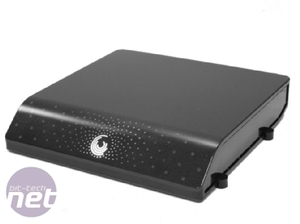 The light gently pulses when the drive is busy, is steadily on when idle and automatically switches off when the drive goes into standby mode, triggered by the termination of the USB, Firewire or eSATA connections. 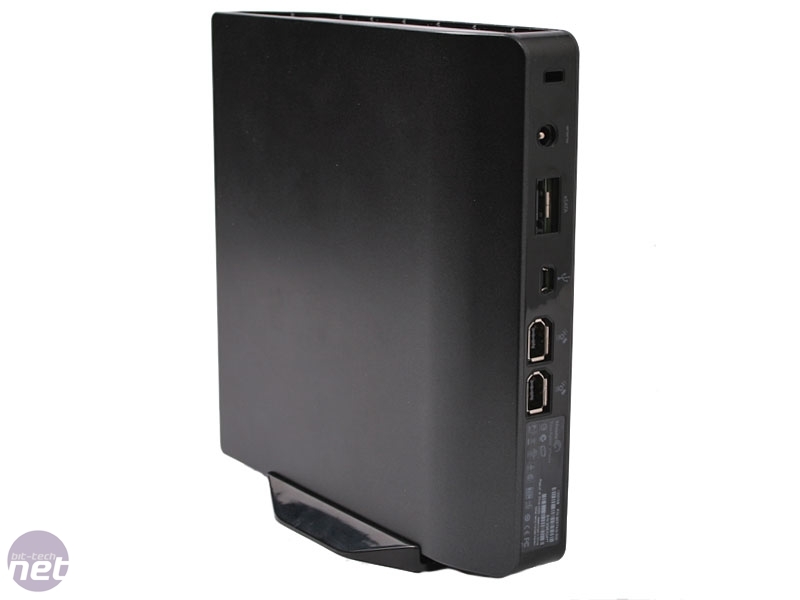 This means that you won’t have to worry about switching off the drive separately to your PC – it drops itself into a low power standby mode automatically, drawing just 5 watts of power. This also means that there’s no power button anywhere on the Freeagent|XTreme and if you really want to save that kilowatt hour of electricity every week you’ll have to switch the Freeagent|XTreme off at the plug or grab an Intelliplug instead. 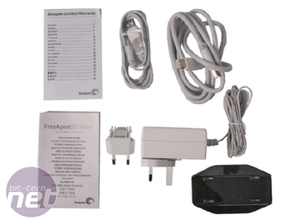 Yes, as it’s a 3.5” based hard disk drive, the FreeAgent|XTreme is still dependant on a DC 12V mains adaptor, although this is a limitation caused by the power draw of the drive form factor which exceeds the amount USB 2.0 alone is capable of delivering, and both Firewire and eSATA do not carry power. Seagate have included both UK and European power adaptors to allow the sale of the same products throughout Europe, and the DC 12V plug has a 2m long cable – plenty of length to reach between your 4-way plug adapter and desktop. 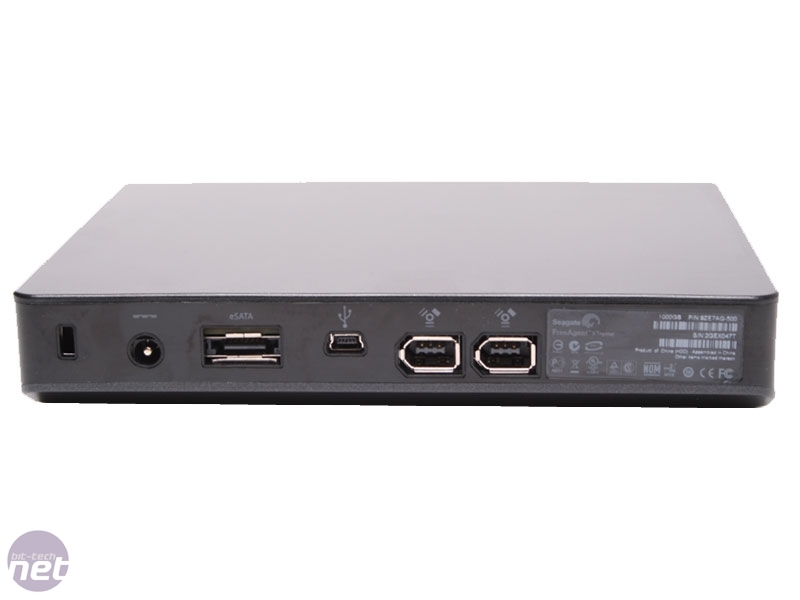 The rear of the drive is where you’ll find all the required ports, with two Firewire 400 ports (for daisy chaining), a mini-USB port and a standard eSATA port. 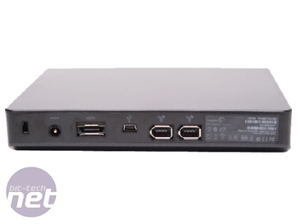 All the plugs are well positioned and spread out, and it’s perfectly possible to have all four plugs connected without the cables interfering with each other, although the drive will only function over the first connection it detects. 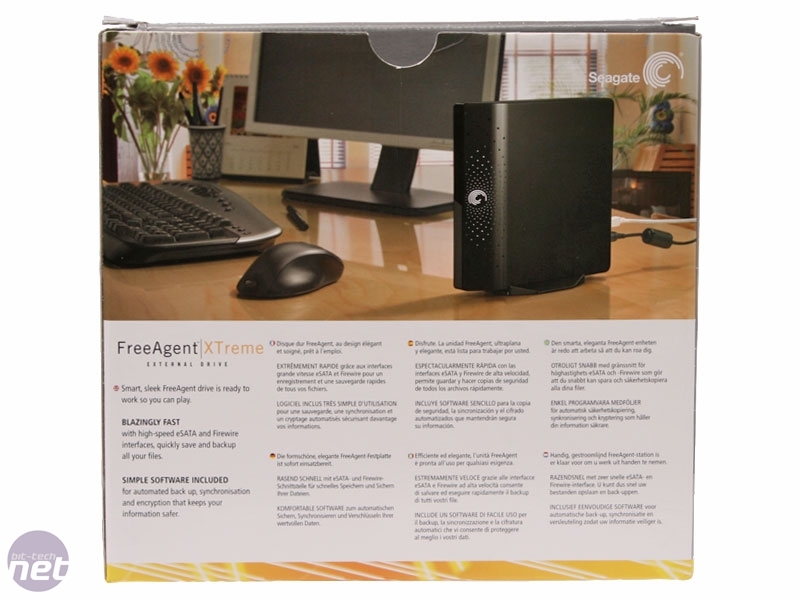 On the topic of cables, we were a little disappointed to find that Seagate hasn’t included an eSATA cable with the FreeAgen|XTreme, especially as the eSATA interface is the drive’s main advantage over the cheaper FreeAgent|desk 1TB. You do get both the appropriate USB 2.0 and Firewire cables though, although the omission of an eSATA cable would leave anyone with a bitter taste in their mouths if they'd bought one on the basis of eSATA, as they aren’t exactly the most costly of inclusions. All in all, it’s a very attractive package, with an extremely uncluttered design – just a shame about the lack of an eSATA cable. Now let’s see if the FreeAgent|XTreme’s software options are just as intuitive. We here at bit-tech have a saying - "you can never have too much storage," In which case the Seagate 1.5TB hard drive seems ideal, packing more gigabytes into a shiny 3.5" drive than ever before. 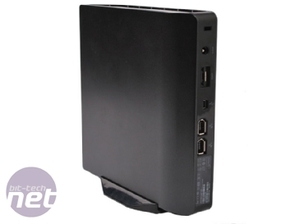 We find out how this jumbo drive stacks up against the competition.